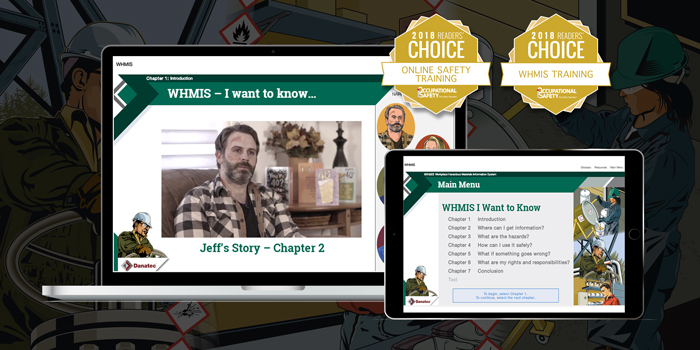 Our award-winning WHMIS online training course meets Health Canada’s training requirements under the Hazardous Products Regulations 100%, for every individual involved in handling workplace chemicals. Our WHMIS online course pulls you into 5 real life situations, told by the people who had the workplace experiences. The engaging content and skill building exercises give you a learning experience which ensures that all of the information is fully understood, retained and easily accessed in the future. A certificate is issued upon completion of the course and test. Also included are free printable resources such as a sample label, sample SDS, glossary, poster and a workplace exercise sheet for reference. Do you have any questions? We are ready to help! Please contact by email sales@whmis.ca or call 1 877 335 1189.